Before we only got a glance and then speculation rose. Now it's officially here and available for sale!! Below are a few pictures sent to us to share with our readers of this new palette.. right in time for the holidays! Are you as excited as I am? yay ^_^... ps. Feel free to click the pictures for a bigger and more detailed look! We left them HUGE for your viewing pleasure. Enough talk, here's the details! Click below to read the rest. 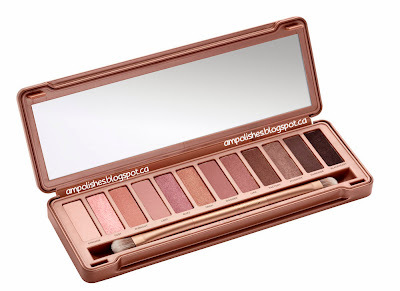 Naked3 comes in a rose-gold coloured tin case (similar to the Naked2 palette). Embossed on top with a big Naked3, this palette will sure be eye-catching! look at that fantastic huge mirror! Usually Naked palettes include a few new shades, this time Naked3 features 12 NEW (and amazing) rose-hued neutrals. It includes every finish from mattes, pearls, to glimmering metallics! Each eyeshadow features Urban Decay's Pigment Infusion System, the proprietary blend of ingredients that gives every shade its velvety texture, rich colour, serious staying power and blendability. Naked3 also includes a double-ended Good Karma Shadow and Blending Brush and an Eyeshadow Primer Potion Sampler with resealable samples of all four formulas (original, sin, eden and the new anti-aging). Each sample is to have about a week's worth! 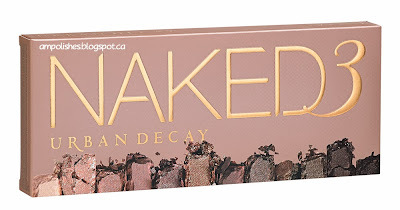 Naked 3 is now available on urbandecay.com* !! * Not American? It's okay! It's also available at Sephora, Ulta and select Macy's stores. Online: sephora.com, ulta.com, and beauty.com. 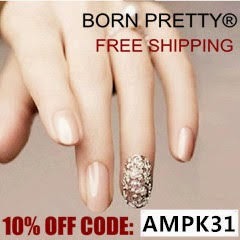 Since both of us at A.M. polishes are nail polish fanatics, this next release is pretty exciting! 2 new nail colours!!! Gotta thank Wende and UD's product development team for picking these two colours to reflect the UD's take on the season. These two colours are really up my alley ;) Need to run, not walk to get these since they're limited edition!!!!! Urban Decay periodically releases limited edition nail polishes but last / this season got me really excited. Mostly because I love skulls as well. Their new bottle is a sleek round bottle but the coolest feature is the cap! It's topped with a skull (with roses for eyes) and on the side it is debossed with Urban Decay! Each bottles holds 10ml and features a 400 strand brush. Urban Decay exclaims that their formula is long-wearing and chip resistant with a high gloss finish. Making their nail polish shiny, tough, durable yet flexible. All of Urban Decay's polishes are 3-free! Formulated without toluene, formaldehyde or DBP. The two shades being released are Blackheart and Zodiac. Blackheart, inspired by the Naked3 shade of the same name is a smokey greige with lots of red and multi-coloured shimmer. Zodiac, the 'sultry lovechild of Urban Decay's most popular Moondust Eyeshadow shade' is an edgy, smokey green with gold, green and blue micro-glitter. Nail Colour: available at Sephora, Ulta and select Macy's stores. Online: sephora.com, ulta.com, macys.com, beauty.com and urbandecay.com. I first saw one in the old version of the original Naked palette. When I saw it then, I wasn't too impressed. Mostly because I do not like brown eyeliner! I love black, the bolder the better!! I found zero too soft in colour and although buttery in application I found it really smudgey against my skin type :(. After a while the double-ended eye pencil in the Naked palette was replaced with a brush.. but now they are back again in 4 different combinations. The original duo Zero and Whiskey: Creamy black and rich matte brown to co-ordinate with Naked. Perversion and Pistol: Blackest black matte and light grey-brown shimmer to co-ordinate with Naked2. Blackheart and Darkside: Smokey black matte with rosy red micro-glitter and purple-taupe satin to co-ordinate with Naked3. Crave and Venus: Darkest brown/black matte and a soft off-white shimmer to co-ordinate with Naked Basics. Double-Ended Eye Pencil: available at Sephora, Ulta and select Macy's stores. I will have to pick up and try the Urban Decay eye pencils once again. From many of my beauty groups they seem to be all the rage!! I hope they stand up to my skin type! :( .. Anyway from this batch of releases it seems the shade Blackheart is very popular amongst the UD team as its being featured as an eyeshadow, an eyeliner and a nail polish shade! Can't wait to check it out!!! 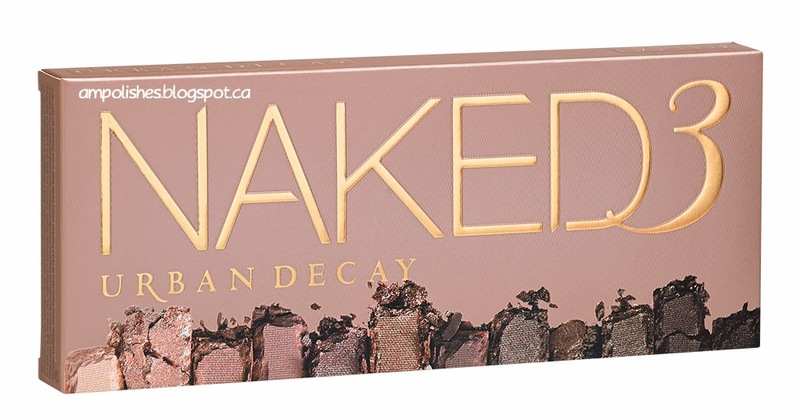 Is there anything you're most excited about being released from Urban Decay..? Being the nail fanatic I am I would have to say Zodiac has REALLY caught my eye.. I cannot wait to see everything in stores :). Information and pictures were sent by Urban Decay. A.M. Polishes only relayed the information and images to their readers and are not responsible for any errors or discrepancies. *ps: I did not receive any official release dates for these products, sorry! O everyone's so excited about Naked 3. I'm on a permanent eye shadow ban but I have to admit the rose hues have really gotten me intrigued. I can't wait for it to come out so I can just swatch myself and see if it's worth getting! Permanent eyeshadow ban? say it isn't so! I actually hardly wear eyeshadow but I still have a lot! I fear these may be too pink / warm for me to wear but still excited to see it come out so I can swatch them myself too! pfftt!! Naked3? I'm still using Naked1 !!! Jamberry Nail Shields Review + Giveaway!! !